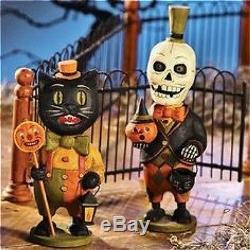 New Bethany Lowe Trick or Treat Duo, Black Cat & Skeleton, Retired Collectible. Crafted of hand-painted paper pulp. Approximately 8" x 3.75" (Skeleton) and 7" x 3" (Black Cat), by Greg Gruedel for Bethany Lowe Designs. Bethany Lowe Designs creates wonderfully nostalgic holiday pieces and reproductions. Join the fun in collecting these vintage-styled decorations. Due to their handcrafted nature--no two are the same--and are most are purposefully designed to look distressed as if from a bygone era. The item "Bethany Lowe Trick or Treat Duo Black Cat & Skeleton by Greg Gruedel, Retired" is in sale since Thursday, February 09, 2017. This item is in the category "Collectibles\Holiday & Seasonal\Halloween\Current (1991-Now)\Decorations\Other Current Halloween Décor". The seller is "specialthingz" and is located in Marietta, Georgia. This item can be shipped to United States, to Canada, to United Kingdom, to Germany, to Japan, to Australia.